Learn­ing to fish at Fam­ily Fun and Fish Day. 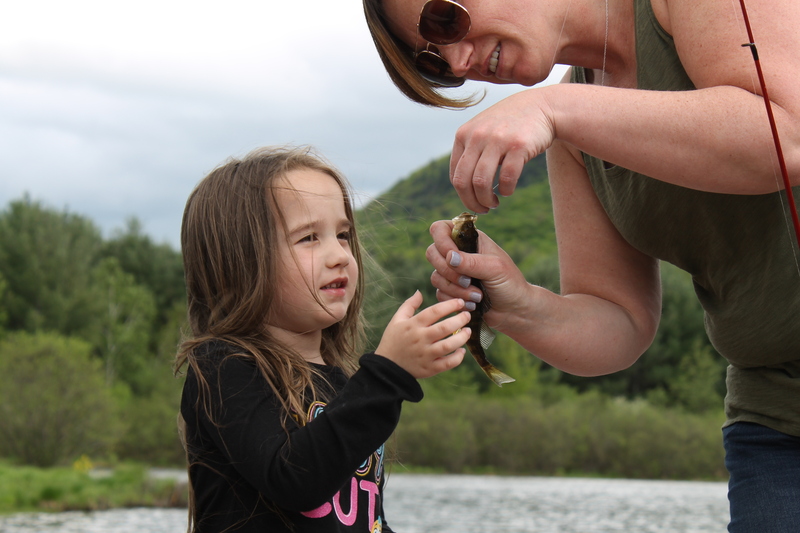 Fish­ing with the fam­ily is a great way to con­nect with each other and expe­ri­ence the great out­doors! Back by pop­u­lar demand for the 7th year in a row, the Ashokan Water­shed Stream Man­age­ment Pro­gram in coop­er­a­tion with Trout Unlim­ited and the New York State Depart­ment of Envi­ron­men­tal Con­ser­va­tion (DEC) is host­ing “Fam­ily Fun and Fish Day” at Ken­neth Wil­son State Camp­ground at 859 Wit­ten­berg Road, Mount Trem­per, NY on Sun­day, May 19 from 1:00 p.m. to 3:30 p.m.
DEC fish­eries staff and vol­un­teers with local Trout Unlim­ited chap­ters will intro­duce youth and oth­ers to the sport of fish­ing and pro­vide edu­ca­tion on fish iden­ti­fi­ca­tion and aquatic ecol­ogy. Other fam­ily friendly activ­i­ties include a bar­beque, arts and crafts, and edu­ca­tional activ­i­ties under the pavil­ion. Please let us know in advance if you have spe­cial needs related to the day’s activities. All fish­ing sup­plies will be pro­vided, though you are wel­come to bring your own if you have them. No fish­ing license is required. For more infor­ma­tion, con­tact Brent Gotsch at 845–688-3047 ext. 3, or by email at bwg37@cornell.edu. DEC charges a $6 fee per car for admis­sion to the camp­ground — all other activ­i­ties at Fam­ily Fun and Fish Day are free. Reg­is­ter by May 16, 2019 in order to par­tic­i­pate. Reg­is­ter online now by vis­it­ing the reg­is­tra­tion page.